Trying not to manage the out come of my work in the studio. 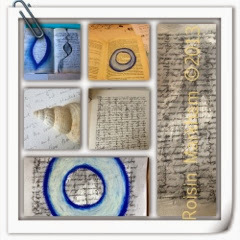 Just letting the work take me to where my imagination and tactile experience of the material flows. I'm happy that the flow seems to be there. Often after a break it can take some time to get back into it. I'm holding each step lightly. Trying not to judge harshly. My imagination wanders to textiles and installation type video on sculpture. Yet practically here in the studio paper, pencil and pastel mingle with water and paint... It is enough. I'm in the studio making work again.